Making healthy meals at home can be easier than you think. In fact many of those favorite comfort foods can be adjusted to give your dish a boost in their health factor. Here are SOME tricks to boosting your home made meals. Adding spiral sliced vegetables to your next pasta dish. Using a spiral slicer, slice zucchini, butternut squash, sweet potato, yellow squash, or your vegetable of choice. Add the raw spiral cut vegetable in with the cooked pasta (50:50) and enjoy. I like the yellow and green squashes the most because the flavor blends well with Italian food. Adding these great vegetables to your pasta will taste just as delicious as original spaghetti and you boost your health factor by creating a dish with 25% more vegetables than before. Adding flaxseed to baking increases the fiber, protein and omega 3 content, and boost the health factor of your muffins or cookies. You can add about 1 tablespoon to the average sized recipe of whole or ground flax. Purchasing whole flax and grinding them up in a coffee grinder or blender is a great way to get the most out of your flaxseed because it makes the nutrients within flaxseed exponentially more absorbable. Seeds have incredibly tough outer husks that do not break open within the digestive tract, which prevents our body from accessing the nutrients locked inside the seed. Fresh is always best, but if you are using canned foods in your meals, sodium content is often a place of concern. The sodium content of canned foods is often excessively high due to preservation purposes. You can easily reduce the sodium content by rinsing off the food prior to using it. For example, if you’re using black beans for a recipe, simply rinse off the beans with water, allow them to drain and use the beans in your meal or recipe. A small sieve works well for easy rinsing and draining. This technique works for all canned vegetables and will help reduce your sodium content by 40% (1) of the canned food’s listed sodium content on the nutrition label. For all you sushi lovers, soy sauce is a staple of the cuisine, but not the ideal condiment of choice if you want to be healthy. Soy sauce is made from fermented soy bean paste, grain, brine, and molds. In fact the popular Kikkoman brand lists its ingredients: water, wheat, soybeans, salt, sodium benzoate; less than 1/10 of 1% as a preservative (2). Does anyone else think it’s odd that wheat is higher on the ingredients list than soy? Ingredients on a nutrition label are listed in order of most abundant to least abundant in terms of weight. The ingredient list can be easily misinterpreted to think that the ingredients are literally what is found in the food, instead of the processed and manipulated version of what it really is. When it list “soybeans” it doesn’t exactly paint a picture of boiled soybeans, mashed into a paste and fermented. Soy sauce is also a high sodium containing food, which is not good for your heart and overall health. 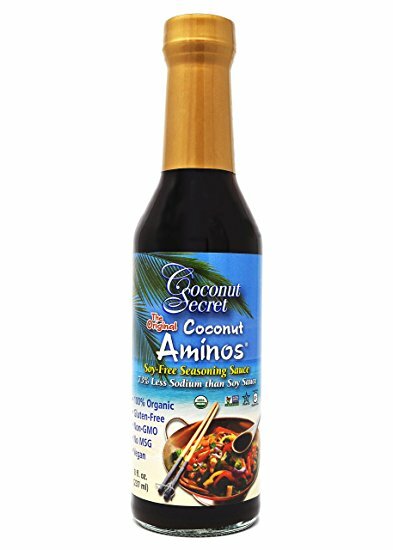 Instead of using soy sauce on your next meal, try Coconut Secret’s Coconut Aminos. Coconut Aminos is made from naturally fermented organic coconut sap and mineral rich sea salt. Not only are the ingredients cleaner for your body, but it tastes exactly the same as soy sauce and has less than half the sodium of the Kikkoman soy sauce (Coconut Aminos 113 mg per tsp. ; Kikkoman Soy Sauce 307 mg per tsp.)(2,3). Lettuce wrapped burgers have become much more popular and is more commonly found on restaurant menus. Forgoing the bun can be an excellent way to drop some calories and include more vegetables into your meal. You can use any lettuce you like. I really like one or two kale leaves, but romaine and butter leaf lettuce works great as well. If you really like your burgers with a bun, try including more vegetables like lettuce, kale, tomato, onion, mushrooms, bell peppers, shredded carrots or radish, or cucumbers. Avoid consuming sugar beverages and adding unnecessary salt, pickles, condiments and high fat toppings on your burger. Fats (like cheese and condiments), salt and monosaccharides (like the simple sugars found in beverages) can slow gastric emptying, which will delay accompanying foods from emptying from the stomach as well (4). Delaying the digestion of animal proteins, especially red meat, is not a great situation for the gut because of animal meats acidic nature and their role as a dietary risk factor for cancer (5). It is ideal to keep animal proteins at a moderate intake and the digestive tract working at a clean and optimal level so that the protein digestion is not delayed any longer than necessary. There are unlimited ways to improve each meal by making small changes or substitutions. These are just a few tip for you to try at your next meal, but get creative and try and come up with new ways to improve you meals to be healthy without compromising delicious! Copp L. Vegetables and Legumes Lecture. Introduction to science of Food. San Diego State University. Lecture Conducted February 27, 2012. Soy Sauce. Kikkoman website. http://www.kikkomanusa.com/homecooks/products/products_hc_details.php?pf=10101&fam=101. Published 2014. Accessed September 3, 2014. Coconut Aminos. Coconut Secret website. https://www.coconutsecret.com/aminos2.html. Published 2009. Accessed September 3, 2014. Gropper SS, Smith JL. Advanced Nutrition and Human Metabolism. 6th ed. Belmont, CA: Wadsworth; 2013, 105. Mahan LK, Escott-Stump S, Raymond JL. Krause’s Food and the Nutrition Care Process. 13th ed. St. Louis, MO. Elsevier; 2012, 636.